There are two medical care experiences as a young child that can produce a fear often into adulthood…the first time they get a shot and visiting the dentist. In earlier generations of health care, children were not referred to a dentist until they were in early elementary school or at least had quite a few teeth. But now, preventive dental care and early education is pushing to have the first dental visit occur as early as possible. The rationale is simple - to get kids comfortable with going to the dentist, to get the feel of what a dentist will do when dealing with issues like cavities, and for giving children early dental care education. Dental cavities are the #1 diagnosed infectious disease of childhood! NLCHC knows that dentists don’t have it easy trying to “sell” the product of dental care to a young child. 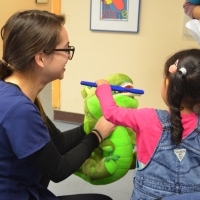 A grant from the American Dental Association was secured to develop a project focused on preventative dental education for pre-school children and their parents. 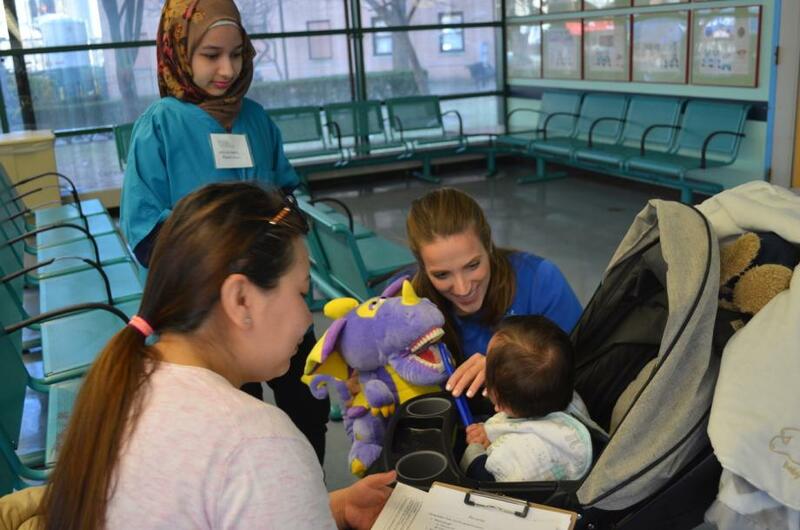 Linda Pan DDS, Dental Assistant Alekki Markou, and NLCHC’s Kristin Moltz, PA, initiated this program and are running it at Elmhurst Hospital’s Pediatric waiting room with a group of fifty volunteer pre-dental college students they have trained. The students work in pairs where one student entertains the children with puppets designed to demonstrate proper brushing techniques, and the other student speaks with the caregivers about current recommendations and how to take care of teeth and the importance of getting into regular dental care or a “dental home” while the children are still young. Surveys are done, and demographics are gathered, follow-ups are made where possible, and parents are given referral cards to local dentists that are linguistically compatible to that family. Each family is given a New Life Community Health Center bag with tooth brushes, tooth paste and preventative care materials to take home with them. Through March we have surveyed and engaged with training 194 families. Thirty-seven percent are Spanish speaking with a mixture of Bengali, Hindi and Chinese speaking being the other primary foreign languages of this largely immigrant community. The funded program will run through May 2018. Based on the response in the first 3 months the students are already asking if we can continue the program in the fall and create more opportunities for students who were unable to be in this first phase. If you would be interested in providing future funding for this wonderful service to families in our community please contact us at NLCHC@NLCHC.org or 718-565-9844. All gifts to this project are tax-deductible.